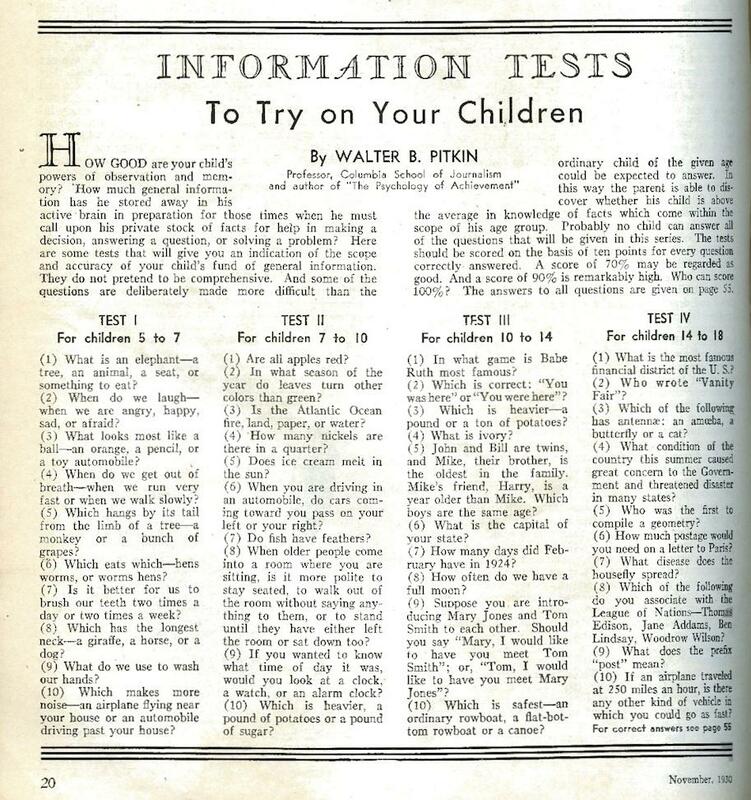 This test ran in Parents (then The Parents’ Magazine) in November, 1930. Written by philosopher and professor Walter Pitkin, the quiz offered parents a way to see just how much information their offspring had absorbed. The Parents’ Magazine was only four years old in 1930, and was a product of its time. More and more advice was available to parents raising children in the American middle class in the first decades of the twentieth century, as the fields of child psychology, social work, and education grew. Markets for kids’ toys, clothes, and books also flourished, and the new magazine featured many advertisements for kid-specific breakfast cereals, bicycles, and soaps. Among the products pitched to parents looking to ensure success for their kids were encyclopedias and non-fiction books about science and history, which were increasingly written for a younger audience. A quiz like this one played upon that parental concern with children’s educational progress. Other questions show deep differences in cultural values. The rules of etiquette might no longer be considered “information,” as they were for a child of 1930. And rather than quizzing teenagers on the authorship of Vanity Fair, first published in 1848, would we pick a novel of equivalent vintage—Faulkner’s Light in August (1931), perhaps? Or is this kind of knowledge no longer considered “common”? The Parents’ Magazine, November 1930.